It is so easy to dwell on pain and suffering and not the highlights. So I'll start with the pain, because it's easy but rest assured there were other events I'll get to as well. Well, my foot is old news by now but we might as well beat a dead horse just to make sure everybody knows. Like the picture? 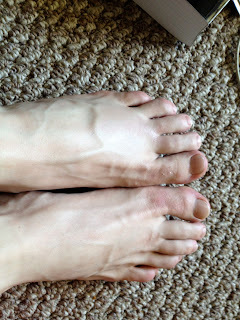 See that lump on the left foot around the 2nd to 4th toes? It's starting to turn colors, like purple and green. It is also clearly locally swollen. Waking up in the morning is always an anticipated event with an injury wondering if it will feel better or worse. A few seconds later you know. Then it more or less means an entire day in that state. Work was work. I finished one project and got handed two more. The highlight of the week had to be when an engineer from another division came to Dubuque to see how we do things. For about two hours he and another engineer I work with talked and talked about testing procedures and common design suggestions. It was great! Sometimes I feel organizations get so big that there is very little if any communication between groups sharing lessons learned and best practices. Instances like this are great for our productivity and alignment. Another thing happened at work. I volunteered to be part of a test group a few weeks ago, or maybe last week. We were having a meeting with everyone both test users, and general users, and the developers who were working on the back end of the implementation. Anyway, I figure this meeting was costing $15-20 a minute, which is on the expensive side for meetings I attend, so I didn't say anything until the end after probably 45 minutes. Then I explained a feature that I found that would solve a number of requests we had for the developers. In other words, in a minute I was able to teach a score of other people about a feature that none of the users or developers knew about. I realize it's a tiny little percentage of my week, but it was one of those validations of my effectiveness. I mean, if you are going to shoot the gun then you had better hit the bulls eye. Running, I don't feel like talking about it. After a slow, and ultimately crippling 18 mile run that broke me, I only ran seven miles the rest of the week and that was two miles too far and too fast. No formal coaching this week although I did spread the usual advice around to anyone who will ask and listen. As I write this I wonder, 'who am I to give advice?' I probably gave myself a stress fracture this week. On the social side it was a good week. I spent some quality time with friends and met a couple new people. Dubuque, and the tri-state area in general is rather nice. There is quite a bit of quality outdoor dining. Probably a couple dozen establishments. I really enjoy being outside. I have been missing Philmont and Tahosa the last few weeks. A few more things, I had sea bass again. That stuff is amazing! On the investing side our favorite DHT Holdings is getting a little positive press from someone other than I. This Seeking Alpha article gives a great financial run down of several reasons to buy DHT. I don't advise shorting stocks as the article recommends. It can be profitable just ask John Paulson, but it is very risky and you can lose a lot of money very quickly. I have never tired it for that reason. Disclosure: I am long (I own stock in it) DHT.